Public Security Minister criticizes Joint List chairman who reaffirmed his party will boycott U.S. Vice President's Knesset speech. 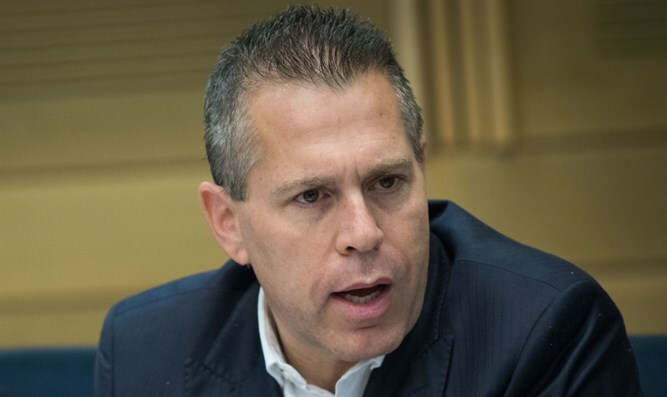 Public Security Minister Gilad Erdan (Likud) on Saturday criticized Joint List chairman MK Ayman Odeh, who had earlier reaffirmed that his party will boycott U.S. Vice President Mike Pence's speech at the Knesset. Odeh wrote on Twitter, "I was asked if there has been a change in our position regarding Pence's visit." "He is a dangerous man, who has a messianic vision that includes the destruction of the entire region. He comes here as the emissary of a man who is even more dangerous - a political pyromaniac, racist, and misogynist who cannot be allowed to lead the way in our area,” he added. In December, before Pence’s original visit to Israel which was later postponed, Odeh declared his intent to boycott Pence's speech. At the time he claimed such a move would "send a clear message to the U.S. administration and the world that there are citizens here who strongly oppose U.S. President Donald Trump’s declaration and clarify that the U.S. has lost its place as the exclusive mediator of negotiations." "West Jerusalem will be recognized as Israel’s capital by the whole world as soon as the government of Israel recognizes East Jerusalem as the capital of the Palestinian state," he said then. Pence, who arrived in the region on Saturday, is scheduled to arrive in Israel on Sunday night. In addition to his speech at the Knesset, the vice president will meet Prime Minister Binyamin Netanyahu and President Reuven Rivlin and also visit the Western Wall and the Yad Vashem Holocaust memorial.